West Windsor, N.J. -- The legendary Howie Landa will never be forgotten at Mercer County Community College. The former men's basketball coach, who came to the college in 1962 and coached for 25 years, will be honored in the coming year. A committee chaired by former MCCC Athletics Director/Professor Emeritus Al Leister is organizing the Howie Landa Tribute. The committee also includes current Men's Basketball Coach Howard Levy; Trentonian sports writer George O'Gorman (the college's former sports information director); MCCC Physical Education Professor Bob Pugh, who was Landa's assistant coach for six seasons; current Athletics Director John Simone; MCCC retiree Charles Smith, another assistant coach; and Academic Counselor Fred Weiner, who advised Landa's players. Landa himself couldn't be more pleased with the honor. "I'm looking forward to coming back. I have been inducted into 12 Halls of Fame, but the greatest honor is to have a court with my name on it. I really appreciate what they are doing for me," Landa said. According to Leister, fundraising for the tribute is already underway. In addition to inscribing Landa's name on the gymnasium floor in the West Windsor Campus Physical Education Building, an event for the public will be held September 15, 2012 to unveil the inscription, followed by dinner at the MCCC Conference Center on the West Windsor campus, 1200 Old Trenton Road. The committee expects many alumni and retirees, as well as long-time faculty and staff still at the college to donate to the tribute and to attend the dinner to reunite with Landa, who will attend the event with his family. Both Leister and Pugh note that the project is the college's way of recognizing Landa's legacy. "He made a huge mark on the Mercer athletics program, the college's reputation at the national level, and the many students - not only basketball players - who were positively impacted by his mentoring and guidance," Leister said. With a total won-loss record of 555-152, Landa first took the Vikings to the national tournament in Hutchinson, KS, in 1964, and returned to nationals in 1968, advancing all the way to the championship game before losing by two points. The 1972-73 team finally brought home the national title, defeating host team Hutchinson and completing a record-breaking 34-3 season. 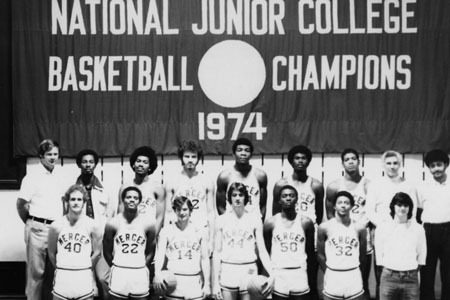 The streak continued with another national title in the 1973-74 season. The Vikings played in two additional national finals in 1976 and 1979. Many of Mercer's players continued their successful basketball careers at four-year schools. With their two national titles, Mercer remains the only Northeast school to win the NJCAA title in men's basketball. Landa led Mercer to 10 Regional Championships and 15 District Championships. He was named NJCAA Region 19 Coach of the Year ten times and National Coach of the Year three times. In addition to basketball, Landa coached baseball, men's soccer, and also served as athletics director in the 1960s. Most importantly, Landa was a professor and mentor to hundreds of students. 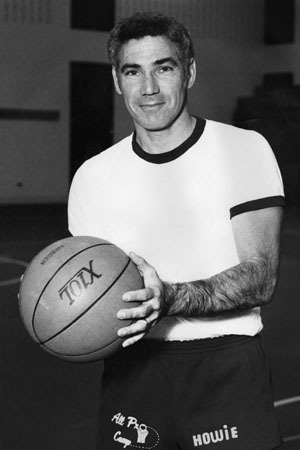 Originally from Philadelphia, Landa had a stellar career as a basketball player at Central High School and then played at Lebanon Valley College in the early 1950s, where he established 16 individual records. In 1953, he was the teams leading scorer, and the Flying Dutchmen won the Middle Atlantic Conference. He then played basketball in the Eastern Pro League and was named All-League in 1957. After his retirement from Mercer, Landa moved to Henderson, Nevada, where he became an assistant coach at the University of Nevada-Las Vegas (UNLV) under Jerry Tarkanian. From 1990-1994, he was also an assistant coach for UNLV's women's basketball team. In 1994, Landa coached the men's team for seven games as interim coach, compiling a record of 5-2. He recently retired from teaching at UNLV. Landa is a member of the Philadelphia Jewish Sports Hall of Fame. in his early days at Mercer. The 1974 national champs! Pictured, back row second from right, Head Coach Howie Landa and, far right, Assistant Coach Bob Pugh. 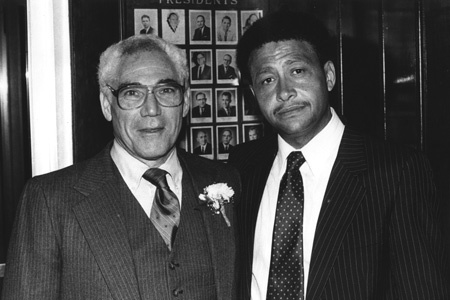 Howie Landa, left, and MCCC Professor Bob Pugh at Landa's retirement dinner in 1987. The committee includes, left to right, Prof. 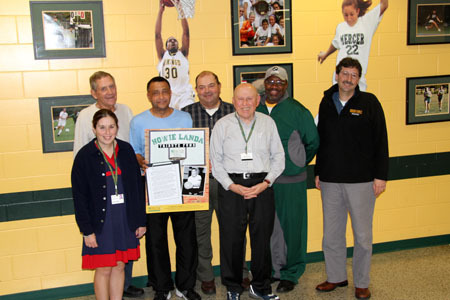 Emeritus and Committee Chair Al Leister (back), Administrative Specialist Erin Cahill, Professor Bob Pugh, Trentonian sports writer George O'Gorman, Academic Advisor Fred Weiner, retiree Charles Smith and Athletics Director John Simone. Not pictured: current Men's Basketball Coach Howard Levy. For more information, contact John Simone at 609-570-3740 or email simonej@mccc.edu. To make a donation to the Howie Landa Tribute Fund or to pledge a gift, visit the MCCC Foundation website here.